Cold weather camping as defined by BSA is “camping in weather where the average daily temperature is below 50 degrees Fahrenheit and conditions are cold, wet or windy.” Chances are, this describes SWC. The most important thing to remember about cold weather camping is to KEEP DRY. Moisture will reduce the insulating properties of almost everything. To keep yourself warm, remember the word COLD. The hints listed below are in a random manner. There is no order of importance to the list, just some suggestions that have proven true over the years. Layer your clothing. Wear several layers of lighter clothing instead of one heavy layer. This way you can better regulate the amount of insulation. When you get warm, take layers off. Getting chilly? Add some more clothing. Keep yourself dry, both from the weather and perspiration. Wear loose fitting clothing, to optimize insulation. Remember when buying clothes for cold weather, wool retains most of its insulation properties when wet, while cotton loose most of its. There are excellent man-made fibers that retain their insulation properties as good as or better than wool. Other benefits include light weight, wide design options & wind-blocking. Rain gear is water proof AND will not allow perspiration to exit (SEE #2). During rainy weather change your clothing several times a day. Athletic shoes and nylon hiking boots do not provide enough insulation. Wear either mukluks, water-proofed leather hiking boots, rubber overshoes or rubberized boots. Waterproof your leather hiking boots with the appropriate commercial treatment. Use only silicon-based products on leathers which require it. Check the care tag that came with the boots. If you choose to wear rubberized boots, remember they do not allow for ventilation, therefore you will need to change your socks several times a day (SEE #2). You may want to get some felt inserts for insulation. Wear a pair of cotton AND a pair of wool socks to increase insulation and wick perspiration away from your feet. or tie or tape them to make a good seal. Wear mittens instead of fingered gloves when you do not need independent use of your fingers. Mittens allow fingers to help keep each other warm. Use a pair of socks to cover hands if mittens get wet. Wear a stocking cap or other warm hat: one that covers the ears and neck area is particularly effective. Heat loss happens through exposed skin of which your head is about 10%. So wearing warm head gear is a must when it’s cold and windy. A scarf reduces heat loss around the neck. Alternatively, a “ski mask” or baklava offers protection from the cold and wind on your face. If you need a fire to keep you warm, you are not dressed properly. If the heat can get to your body, so can the cold. Paper is a good insulator and can be wrapped around the body (under your clothes) to add insulation. Natural fiber sleeping bags do not maintain their insulation properties when damp, down bags also fit here. A 3 to 4 pound synthetic bag will take care of most of your needs. A mummy style bag is warmer than a rectangular, as there is less space for your body to heat. Also, most mummy bags have a hood to help protect your head. If you only have a rectangular sleeping bag, bring an extra blanket to pack around your shoulders in the opening to keep air from getting in. Do not sleep with your head under the covers. Doing so will increase the humidity in the bag that will reduce the insulation properties of the bag and increase dampness. Remember to air out your sleeping bag and tent, when weather permits. Perspiration and breath condense in the tent at night and the water will reduce insulating properties of your bag. Wear a stocking cap to bed in order to reduce heat loss. Wear a loose fitting hooded pullover type sweatshirt to sleep in. Make a loose fitting bag from an old blanket or carpet padding to put both feet in when in your sleeping bag. A bag liner either purchased or made from an old blanket, preferably wool, will greatly enhance the bags warmth. Insulate yourself from the ground as much as possible to avoid cold spots at the shoulders and hips. Use a sleeping pad of closed cell foam instead of an air mattress. A good rule of thumb is that you want 2 to 3 times the insulation below you as you have over you. Sleeping bag’s insulation becomes compressed and is not as effective below you. Use a ground cloth to keep ground moisture from your bag. Your body will warm up frozen ground to a point were moisture can become important. Space blankets, if used as a ground cloth, will not reflect the body heat. Instead it will conduct the cold from the ground to your body. Cold air will be above and below you if you sleep on a cot. Put a hand warmer (in a sock) at the foot of your sleeping bag before getting into it. Or, fill a canteen with hot water (not boiling) and place at foot of bag to keep warm. Be careful with plastic canteens. Exercise before bedding down to increase body heat. This will help to warm your bag quicker. Be careful not to start perspiring. Remove the clothes you are wearing before bedding down if they are damp with perspiration. Put on dry clothing or pajamas before entering the sleeping bag. Build a wind break outside your tent by piling up snow or leaves to a height sufficient to protect you when laying down. Never store your sleeping bag compressed. Hang it up, lay it out, or use a very large stuff bag between trips so the filling will not compress and lose its insulating properties. Before you get out of bed bring the clothes you plan to wear inside your bag and warm them up some before dressing. Place an empty capped plastic bottle outside your tent door for “night calls.” This will reduce your exposure when you have to answer that call. Think twice before using it inside the tent, especially if you have a tent mate. Remember to empty the bottle away from the camp in the morning. If at night you get cold, let the leadership know so action can be taken before injury from cold weather health problems occur. 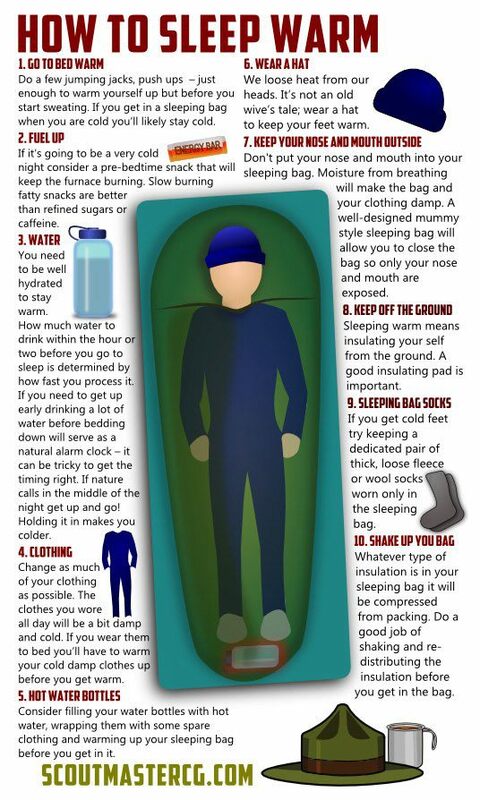 In other words it’s better to be kidded about forgetting your sleeping bag than risking hypothermia. If shivering does not go away after 10-15 minutes in your sleeping bag, seek help and warmth. It will not get better. Organization and proper preparation is very important in cold weather camping. Good meals, proper shelter and comfortable sleeping arrangements make for an enjoyable outing. Drink 2 quarts of fluids per day besides what you drink at meals. Cold reduces your thirst feeling but you are still becoming dehydrated through exertion and dry air. Learn to recognize and treat cold weather health problems. These include frostbite, hypothermia, dehydration, chilblains, trench foot, snow blindness and carbon monoxide poisoning. Use the buddy system to check each other for cold weather health problems. Notify the leadership if symptoms do occur. If you feel cold gather some wood or do some other type of work. Working will help warm you. Eating ice or snow can reduce your body temperature and it is not pure. Don’t eat it. Snow and ice can be used for drinking water but only after boiling. No open flames (candles, matches, etc.) inside the tents. It consumes the oxygen and is a fire hazard. Wiggling your toes inside your boots will help keep feet warm. If your feet get cold, they are not insulated well or your body is conserving heat in it’s core. Speak to the leadership. Take and wear sunglasses if snow is in the forecast. The glare of the sun (even if it’s going to be cloudy) off the snow could lead to snow blindness. Sunglasses will reduce the glare. Use fuel hand warmers. They are cheap and easy to use. The double as foot warmers, too! Keep off ice on steams, lakes and ponds. Always, always, always! It takes longer to cook food in cold weather, so plan accordingly. Before going to bed pour enough water for breakfast into a pot. It is easier to heat the pot than a plastic water can. Keep matches in a metal match safe as plastic can freeze and break if dropped. Gather twice as much fuel as you think you’ll need for fires. Carry tinder from home. It may be hard to find in snow or wet conditions. Gather wood and tinder for the morning fire in the evening so that you will be able to start the fire quickly in the morning. Space blankets make good wind shields only. The metallic properties take over the insulation properties in cold weather and become cold conductors. Carry extra plastic bags in cold weather. They can be used as personal wind shields and ponchos by slitting a hole in the top for your head to go through. Carry extra matches because the more you need a fire to warm up the less likely you will be able to start one easily. Flashlight batteries are affected by cold. You can revive a dead battery by warming it up near the fire. You may want to take a bottle of propane into your tent with you at night. This will keep it warmer and make it easier to light your stove for breakfast. Heaters inside your tent can lead to carbon monoxide poisoning. Select the proper type and amount of clothing. Regulate your clothing according to your activity rate. This is the most effective way to ensure comfort. Pay attention to your bodies’ signals. Don’t wait until you are cold to put on more clothing. Act when you first begin to feel cooler. The most dangerous. Wide temperature variations from melting during the day to freezing at night makes proper dressing difficult, and important. Damp conditions from melting snow or rain makes keeping dry difficult. Ground is frozen and snow is dry and crystallized. Strong winds cause the most concern with keeping warm. Extra clothing layers and wind-proof outer garments should be added. Requires the most insulation and wind-proofing. Many materials change physical properties, becoming brittle. Only for the most experienced campers.